The silver tsunami has hit the shores of many developed countries across the globe, and Singapore is no exception. As of June 2017, approximately 13 percent of Singaporeans are above the age of 65, and this proportion is projected to almost double to 25 percent by 2030. Innovations that support an aging population are necessary if our tiny red dot is to weather the silver tsunami. 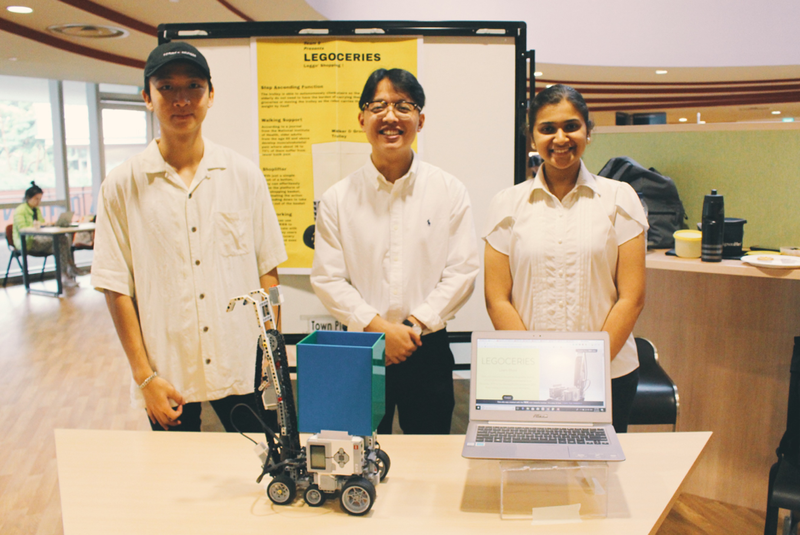 Hence, on 11 December 2017, undergraduate students from various disciplines at the National University of Singapore (NUS) received a special mission brief: create robots out of Lego bricks, recycled items and 3D-printed parts to assist the old and infirm. 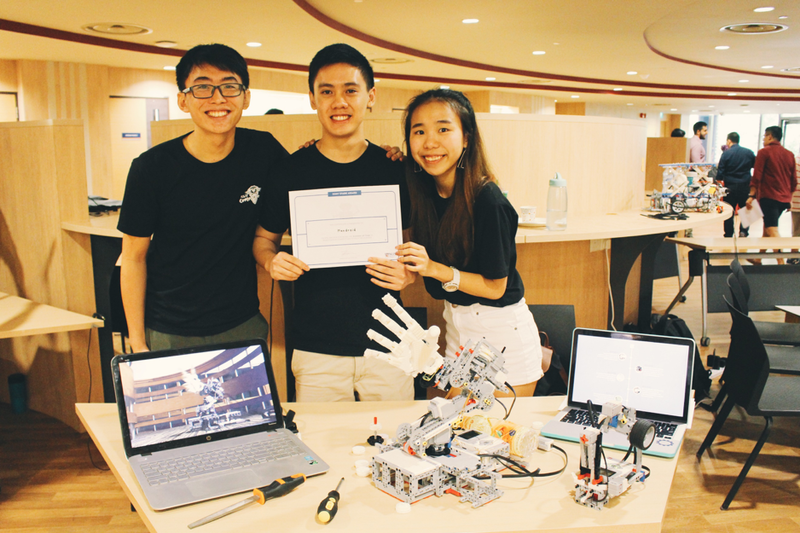 They were participating in the Robots@NUS Maker Challenge, jointly organised by NUS’ School of Computing and School of Design & Environment, and had only a month to assemble their creations. “We felt that such a competition would be an interesting way to engage young people in addressing these kinds of societal issues. At the same time, they could exercise their creativity to come up with innovative solutions that use technology to address real-world problems.” said Dr Soo Yuen Jien, senior lecturer at the NUS School of Computing, who organised the competition. 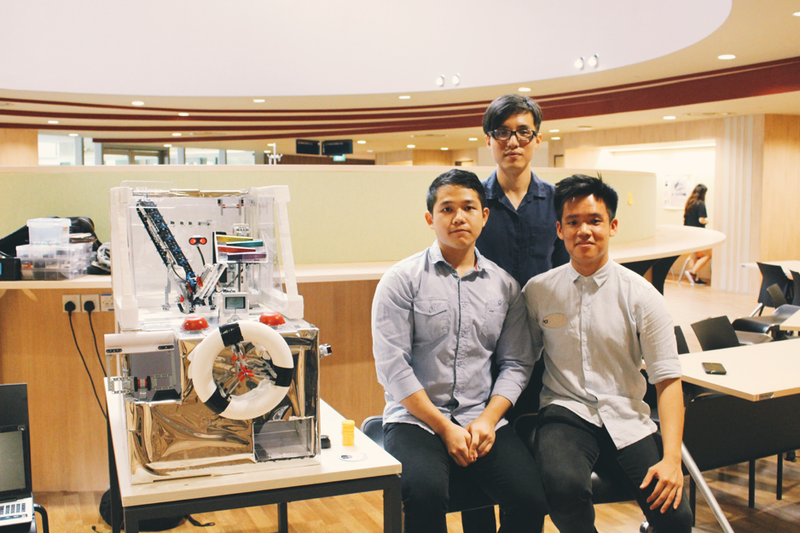 By 8 January 2018, a host of robotic devices were on display at the NUS University Town for judging by a panel consisting of Dr Anand Bhojan, Senior Lecturer, NUS School of Computing; Assistant Professor Alfred Kow, Assistant Dean (Undergraduate Education), NUS Yong Loo Lin School of Medicine; Mr Kenneth Pinto, Lead Educational Technologist, NUS Centre for Instructional Technology; Dr Rajesh Panicker, Lecturer, NUS Faculty of Engineering; and Mr Qutubkhan Zoher of education firm Duck Learning. Taking the top prize was the Silver Flexer, a fitness machine that incorporated an interactive robot with the classic Pinball game. The machine requires players to carry out simple movements to exercise muscles that are frequently used for everyday tasks such as turning door knobs. Players will receive rewards in the form of tokens, which can be exchanged for coupons or vouchers. “With advancements in technology, many inventions have been created to help elderly people with their daily activities. Although these technologies come with their own benefits, my team and I believe that we also need to tackle the root of the problem—the weakening bodies of the elderly,” said Mr Clement Tan Chun Hoong, a second-year student at the NUS School of Computing, whose team also comprised NUS mechanical engineering students Mr Heng Meng Pei and Mr Chua Song Yu. “We think this machine can be placed in nursing homes, not only to keep the elderly physically healthy, but also to encourage social interaction among them. They could perhaps even have a friendly competition of sorts!” Mr Tan quipped. While the Silver Flexer helps maintain fitness, elderly people who may have already lost their strength or physical function may need help with day-to-day tasks, such as cooking. For example, Uncle Soo [not his real name], a retired chef who was famous in NUS for his fried kway teow, was no longer able to carry his heavy wok due to wrist pain. This made him very upset, as cooking had been his pride and joy. To give Uncle Soo a helping hand with his wok, the runner-up team created the Handroid—a robotic arm that mimics the movements of a human one. Using a human body motion translator, the device detects arm movements and communicates it to a mechanical arm via Bluetooth technology.“We were motivated by the thought that the elderly, having grown frail, might become too weak to carry a cooking wok,” said Mr Francis Lee Jun Yao of the NUS School of Computing, whose team consisted of Mr Shannon Wong Peng Fai and Ms Caryn Heng Zi Xuan, both computer science undergraduates at NUS. “Our initial idea was actually to create a ‘autonomous’ wok, but we felt that it would only benefit a limited group of people. So we came up with Handroid, which can not only cook, but also help with other physically straining tasks.” Mr Lee explained. Speaking of physically straining tasks, carrying groceries up a flight of stairs presents another major hurdle for seniors. “When elderly people go grocery shopping, they find it difficult to lift or carry the items back, especially if there are staircases in the way,” said Ms Gollapudi Venkata Sambhavi Deepthi, an electrical engineering student at NUS. Together with architecture student Mr Benedict Ho Jun Xian and industrial design student Mr Lim Jing Jie, she created a staircase-climbing shopping trolley, Legoceries, which bagged them the third prize in the competition. The robotic trolley has another unique function that the team calls the ‘shoplifter’. With the push of a button, located on the handle, the bottom of the shopping cart can be raised. This function was built on the concept of worm gears and a scissors lift and helps the trolley go over obstacles. Clearly, while robots look set to do most of the heavy lifting for the elderly in the future, a simple user interface is just as important to encourage the elderly to adopt these technologies in their everyday lives. In a manpower-scarce country like Singapore, helping the elderly to stay active is crucial. 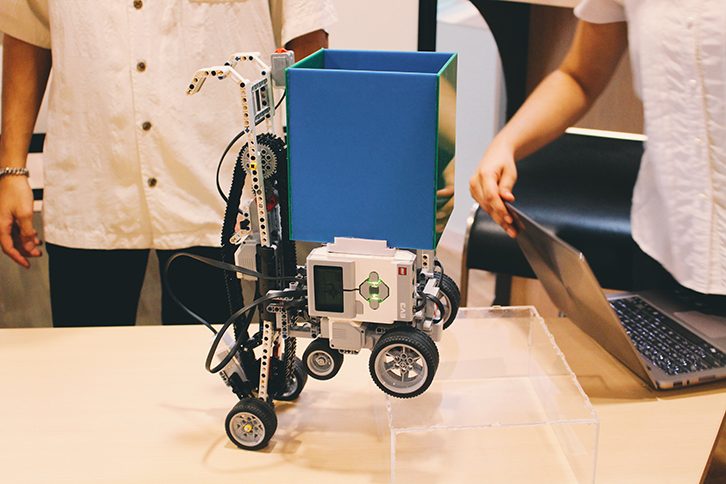 Automatons look set to become an integral part of Singapore’s ‘aging-in-place’ vision and competitions such as Robots@NUS help plant the seeds of innovation early on.